"Son of God" producers Mark Burnett and Roma Downey have cast Satan out of their upcoming Biblical epic about Jesus Christ, an individual familiar with the 20th Century Fox project has told TheWrap. "Son of God" is a reshaped version of last year's hit History Channel miniseries "The Bible," which co-starred Mohamen Mehdi Ouazanni as Satan. 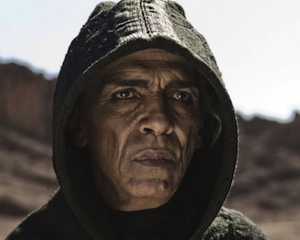 Burnett and Downey came under fire last year because Ouazanni bears a striking resemblance to President Barack Obama, though the producers said at the time that the casting controversy was unintentional and merely coincidental. "If I had a father..."
This must have really struck a nerve. Wouldn’t want to offend the left’s delicate sensibilities.